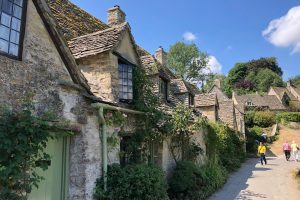 Whilst staying on one of our Cotswold Holiday Cottages in Broadway, one of the Cotswold villages we recommend visiting is the pretty picture-postcard village of Bibury. 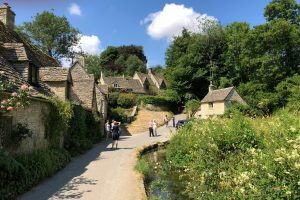 Bibury, once described by William Morris as the ‘most beautiful village in England’ is about a 5o minutes’s drive from our holiday cottages in West End. During the drive across some of the most beautiful Cotswolds countryside, the landscape changes from rolling hills and ridge and furrow fields inhabited by sheep, to expansive fields of arable crops but the dry-stone walls boundaries of the honey-coloured Cotswold stone are still a wonderful feature. 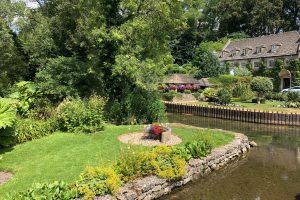 On arriving in Bibury you will find free on-street parking along the banks of the River Coln, a tributary of the River Thames, that meanders through the village. 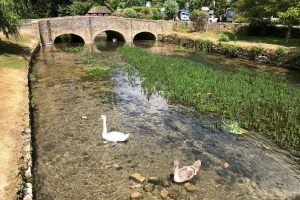 From there you can wander across the rustic bridge over the river with its clear waters, swans, Brown Trout and dragonflies, to Arlington Row. 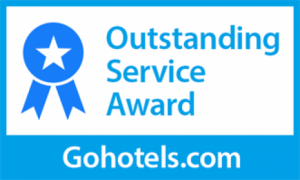 Owned by the National Trust, is a row of idyllic Cotswold stone cottages. The cottages were once a 14th century monastic wool store later converted in the 17th century to weavers’ cottages. Arlington Row is one of England’s most iconic and photographed places – it even appears on the inside cover of UK passports! From there wander up Awkward Hill (a short climb) and down along Hawkers Hill back round to the main street. Alternatively take the footpath across Rack Isle, a boggy water meadow also owned by the National Trust. Rack Isle is an important habitat for a wide variety of wildlife and in late summer a small herd of Belted Galloway cattle (one of our favourites) graze the land. In the centre of the village you will find Bibury Trout Farm, Arlington Mill (now a private dwelling), the Church of St Mary, tea rooms, restaurants and pubs serving food (our favourite is the 15th century Catherine Wheel Pub). The gardens at Awkward Hill Cottage are open by arrangement under the National Garden Scheme between July and September. 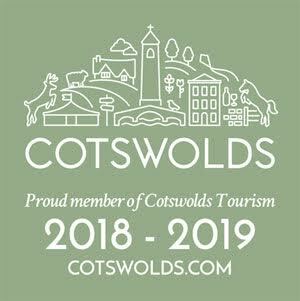 The owner of the cottage, Victoria Summerley, is an award winning garden journalist and author of ‘Secret Gardens of the Cotswolds’ and ‘Great Gardens of London’. All content © Broadway Manor Cottages 2017. All rights reserved.